Hardware acceleration Handbrake DVD ripping and HEVC (H.265)/H.264 video encoding guide. Best Intel QSV and GPU hardware acceleration video converter. Q 1: Is there any way that Handbrake could better utilize hardware acceleration to speed up encoding time? Q 2: How to enable GPU based encoding in Handbrake? Will it be more efficient than CPU based encoding? Q 3: Handbrake now supports hardware accelerated encoding. Is there a visible improvement when it comes to fps compared to CPU encoding? Intel Quick Sync has been praised for its speed. Handbrake Intel Quick Sync Video hardware acceleration tech enables you to improve video conversion speed a lot. According to our limited testing, we can see it is about 4 times faster video encoding when using the Intel QSV based H.264 codec than the CPU-only codec. Check the guide below on how to enable hardware acceleration Intel QSV to encode H.265/H.264 with Handbrake. 1. Support Intel QSV and NVIDIA CUDA/NVENC hardware acceleration to encode and decode videos. Helps you convert video at ultrafast speed with best quality. 2. Convert almost all 8K/4K/HD/SD videos from one format to another like MKV, HEVC/H.265, M2TS, AVCHD, camcorders/drones videos, MP4, AVI, MPEG, WMV, etc. 3. Free download 8K/4K/1080p/720p videos, movies, MP3 songs from YouTube, Dailymotion, Vimeo, Vevo and 1000+ sites. 4. Edit/cut/merge/crop/stabilize/effect/subtitle videos. Convert DVD. Record screen. Clean program. Handbrake newest version 1.2.0 supports Intel Quick Sync Video, Nvidia NVENC, AMD for H.264, HEVC/H.265 encoder. You can now use Handbrake to encode H.265/H.264 video with Intel QSV, Nvidia NVENC hardware acceleration. Below will show you how to rip DVD or decode video to encode into H.265/H.264 using Intel QSV acceleration. Note: Intel Quick Sync requires a 2nd generation (Sandy Bridge) or newer Intel Core series processor with integrated Intel HD Graphics enabled and a directly connected display. Handbrake Quick Sync feature is only supported on Windows. Preparation: Download and install the free and open source Handbrake from its official site: https://handbrake.fr/. Step 1: Open Handbrake and click "Source" button to load the inserted DVD disc or import source video file. 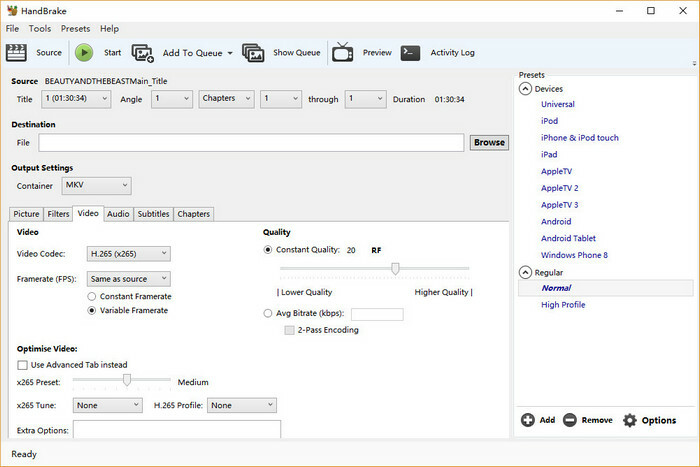 Step 2: Click "Browse" to set a target folder to store the encoded H.264/H.265 video. 2GB or more computer system storage is recommended for processing and storing your new videos. Step 3: Handbrake only provides two output formats: MP4 and MKV. Choose one preferred video container. MP4 is more popular and compatible. 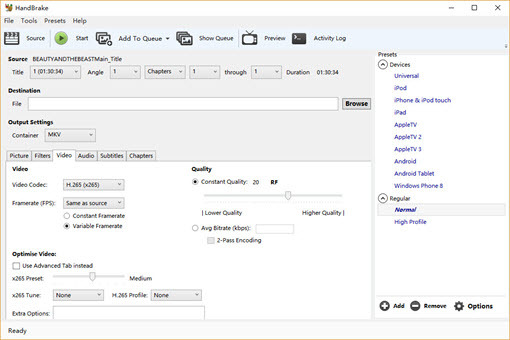 Tip: The encoder settings can affect video encoding performance. Usually the higher the settings are, the longer time it costs. (HQ – low speed/large size, LQ – fast speed/small size). Quality: Tick "Constant Quality" and keep the data at around 20. 23 will trade off speed vs quality and file size especially for 1080p videos. Step 5: Hit "Start" to run the Intel QSV hardware acceleration DVD ripping/H.265 (H.264) video encoding process with Handbrake. Test Computer: Windows 10 Pro; Intel(R) Core(TM) i5-3470 CPU; 8GB RAM; 64-bit OS. No other program is running on computer when testing Handbrake ripping DVD to MP4. Verdict: 1. If you select Intel QSV, you need to set Avg bitrate by yourself. 2. The interface of Handbrake is complex and is not suitable for beginners. 3. The output video quality is not good, especially when you choose Intel QSV hardware acceleration tech, the output video may be distorted. Verdict: 1. The DVD disc loading time is long. 2. Scan titles one by one. 3. The output file is .m4v. 4. The output movie video is all pixelated. 5. Handbrake can't deal with copy-protected DVD. 1. Handbrake offers very limited input and output formats. 2. By testing, Handbrake outputs a lower quality (even blocked video) with a larger size when using Intel Quick Sync than using x264/x265 encoder only. 3. Handbrake can't rip copy-protected DVD. 4 . Encoding H.265/HEVC with Handbrake is very time-consuming. To balance the video encoding speed, output quality and file size, the top Handbrake alternative - WinX HD Video Converter Deluxe - does a great job. It supports both Intel QSV and NVIDIA CUDA/NVENC hardware acceleration in H.265/H.264 video encoding. As the best hardware accelerated video converter for Window (10), WinX HD Video Converter Deluxe can fully utilize Intel QSV and NVIDIA CUDA/NVENC GPU hardware acceleration to maximally speed up video processing while keeping best output quality with a reasonable file size. This tool is a powerful combination of video converter, video downloader (free function), video editor, and video maker. It enables you to flawlessly convert almost any video; free download any 8K/4K/1080p/720p videos/movies, 2019 new MP3 songs, etc. from YouTube and 300+ sites; trim, crop, merge video, adjust video/audio parameters; make photo slideshow video. Free download and install WinX HD Video Converter Deluxe on Windows 10/8/7, etc. and follow the easy steps below to fast encode H.264/H.265 video with Intel QSV and NVIDIA CUDA/NVENC GPU hardware acceleration. Launch the hardware accelerated video transcoder VideoProc and click "Video" and "+Video" button to load source video file. 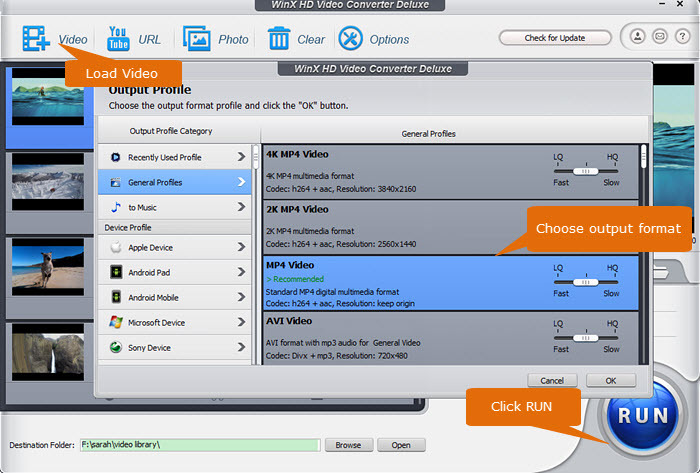 Unlike Handbrake, WinX HD Video Converter Deluxe provides vast output files incl. 370+ video & audio codecs, 410+ preset device profiles like iPhone XS. Click PC General Video -> AVC Video (H.264), or, HEVC Video/General Profiles -> MP4 Video (H.264 codec) to choose H.264 or HEVC/H.265 as output. Then tick Hardware Encoder Intel or Nvidia. If your computer supports both Intel QSV and GPU hardware acceleration, you can click both to accelerate video encoding speed at utmost. Hit "RUN" to start encoding H.265/H.264 video with Intel and GPU hardware acceleration. The conversion speed will be ultrafast and the output quality will be great while getting a smaller file size than other video converters. Convert almost any video. Encode HEVC/H.265, H.264 video with Intel and CUDA/NVENC GPU hardware acceleration. Free download 8K/4K/HD/SD videos, 1080p/720p movies, MP3 songs from YouTube and 1000+ sites. Edit video. Advanced video/audio settings. Convert DVD. Record screen/webcam. 100% clean software. [Answered] Does HandBrake Support NVIDIA CUDA Acceleration?